Is My Wooden Pallet Safe To Reuse? Reusing wooden pallets is incredibly popular these days, largely because they can be used to make so many things, from tables and toy boxes to planters and chairs. Not all wooden pallets are suitable for the job, however, and it is important to ensure that the wooden pallets you want to use are safe. There are two main ways to make sure that the second hand wooden pallets you want to use are safe: where they are sourced from and what markings they have on them. Firstly, it is important that if you buy wooden pallets to reuse that they have not been contaminated by shipping perishable items or even toxic chemicals. Instead, source second hand wooden pallets from reputable places and, if in doubt, ask your supplier if the pallets are safe to reuse. Many wooden pallets undergo chemical treatments, but there are markings that you can check for on pallets to ensure that you do not end up using those which have had these toxic chemicals applied. Some pallets may have more than a single marking, and it is important to remember that an unsafe marking will usually supersede a safe one. In general, safe pallets will carry the DB, KD, EPAL or HT markings, meaning that they haven’t been treated with dangerous chemicals. Pallets marked with the letters DB have not been treated at all, while EPAL, KD and HY markings mean that the wooden pallets have been kiln- or heat-treated rather than being treated using toxic chemicals. Markings to look out for include MB, which indicates that the wood has undergone treatment with the toxic chemical methyl bromide. 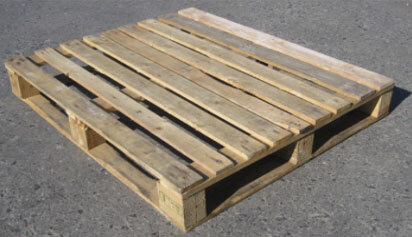 A pallet may also be unsafe if it has the letters EUR but not EPAL as well. This is because it is an older code, meaning that you can’t be sure what it has been treated with, and it is on occasion when a safe marking (EPAL) overrides a potentially unsafe EUR marking. Another easy way to tell if pallets may be dangerous to reuse is if they are brightly coloured, as this could indicate that they have previously been used to move toxic chemicals. If in doubt, it is best to avoid reusing such pallets. Other pallet markings can include the code of the country they were made in and other identifiers. These may not give you specific information about their safety, but some countries are known to produce safer pallets than others. Newer British, Canadian and American pallets, for example, are largely safe as most are heat- or pressure-treated rather than being fumigated with chemicals. Pallets must now have the Integrated Pollution Prevention and Control (IPPC) logo and are typically marked with a country code, unique number and either HT or MB. DB is also used to signify debarked. There are a multitude of uses for safe second hand wood pallets. Some of the most popular choices include shelving units and display cabinets, storage containers, benches, planters, decking, headboards and beds, coffee tables, sofas and even kitchen units and breakfast bars.